Man, I'm so glad to see my kids. Now that I'm home, reflecting on this indescribable week, I'm overwhelmed with affection for the little ones God has entrusted to me to raise toward the light. I don't deserve them. They are a gift. As was this week. How do I carry what I saw this week forward into the life God has chosen me to live? I want to take a moment to fill in some of the picture of what we saw at ZOE this week and the evidence of God at work. I saw our team going above and beyond in constant and tireless humility to offer whatever they could to support the ongoing work at ZOE. Denna battled through allergies, motion sickness, and physical exhaustion to extend her medical expertise to all the female ZOE children and ministry students. She showed each one of them that they are worthy of time and personal care. Fred and Carol humbly accepted the role of medical assistants, keeping equipment clean and documenting findings so that each child could be seen in our short time there. Pam, Carol, and Zohreh helped paint a new dormitory during their scant down time. Karen and Irene met with and prayed life over the children's home parents, also interviewing them about concerns for their kids so that the visits would go smoothly. There was so much to do and so many wonderful things to partner in that I can't write about all the ways I saw this team extend God's love. Just know that these incredible prayer warriors and encouragers have been faithful to do a work that God will multiply over time within the larger work going on at ZOE. Speaking of the larger work going on there, one of the many ways ZOE is involved in redeeming Thailand for God is by helping to coordinate a network of pastors throughout the country in order to supply food and resources for those in need in their communities. Recall that under 1% of the Thai population is Christian, and that poverty is rampant in the rural communities. Not only does ZOE help coordinate the distribution of food and supplies to show the love of Christ, but they are also innovating and improving self-sustaining agriculture solutions such as an on-site pig farm (over 100 pigs bred from just two originally), a hydroponic fish farm (the fish water and feed over 70% of their own food), a mushroom hut, and sustainable gardening. This is not only a way to provide for the on-site needs at ZOE, but this knowledge is carried out to the community to help break the cycle of poverty. This is the Thai people equipping the Thai people. So many needs and so many ways to help. I haven't even talked about the ZOE children's home parents, these mighty warriors of the faith who show love day in and day out to the least of these. Please be in prayer for these saints. They are doing battle daily against the powers of darkness that would try to overtake these children's hearts, and only by the great grace of our God do they bear up under it. These people understand what it means to depend on Him day in and day out. They understand the fallacy of the self made man. Please. Be in prayer for these saints. I sit here in my comfortable life lamenting my parenting failures (and there are many), despondent and paralyzed in fear of that failure, while these indomitable saints plunge into the darkness in order to pull souls out for the glory of God. When I see these people, I realize that I deserve nothing that I have. It is all a gift. These people are living proof that when we choose to stare evil in the face, God stands before us in order to be our greatest victory. The Christian faith is about declaring Gods ultimate victory in the here and now. It is about us allowing God to show He is able to do the impossible through through the lives of His children. There's the groundskeeper, who walks over the entire 55 acre complex daily tending to this city of God. He carries his equipment, and his 59 year old joints are not as flexible as they used to be. But ZOE doesn't have money lying around to buy him a motorized cart. Any resources that come in are used toward whatever the donor earmarks it for. A cart for the groundskeeper simply isn't something anyone has donated toward yet. So many needs and so many ways to help. ZOE currently serves as home to over 50 children and over 30 ministry students. The vision they shared with us is that they would eventually expand to house 2,500 children in need and train 1,000 ministry students. I have no doubt in my mind that this is possible. I also have no doubt that the need is that great. My brothers and sisters, there are still kids out there! Kids in distress, and kids who are being victimized by human trafficking. Children whose every moment is drenched in the hopelessness that comes from not knowing if there is an end to the nightmare. Beloved children of God who do not know there is a God who knit them together in their mother's womb, because life has told them the exact opposite: that they are worthless, voiceless, and unlovable. We deserve nothing we have. It is all a gift. Why? There is still work to be done! And this sobering thought strikes me: what if? What if it were my child? Lord, thank You that Hannah, Taylor, Avery, and Kellen will not have to be subjected to such horror. The horror I feel at the mere thought of one of my kids in such a situation is not even a fraction of the heartbreak God feels whenever one of his children is victimized by sin. Thankfully He has chosen me to be a conduit of His love and watch care over them. Lord, accept my failures and be my strength. It wasn't meant to be this way. We know it in our hearts. We are blessed to know God is a God of redemption and that He is working in the midst of great evil to bring about His victory. But these kids don't. Over 99% of Thailand doesn't. Someone in your life doesn't. How can I sit idly by when people remain enslaved by sin? When children are enslaved by sin? How can I possibly continue to marinate in my own laziness and selfishness? I will not. ZOE's mission is to reach every person, rescue every child. I want that to be my goal, just as it is God's goal: That none should perish and that none should be left blind to the fact that He loves them beyond words. The main thing I learned this week? It's all about God. The story He is telling revolves around the themes of need and provision, hopelessness and rescue, failure and redemption. When we realize our need for God, He is faithful to meet that need intimately, as only a Father would, be it spiritual, physical, material, or relational. He is Lord over it all. When we feel hopeless, God offers rescue, because you are His beloved child. When people fail, God shows us that He never fails. Don't fear failure, because failure on a human scale ultimately serves to magnify God's power. We had the chance to witness the confession of new faith in 103 kids due to ZOE's outreach this week. Over 400 have occurred over the past month. One person from our sister team came to Christ this week. The soil is fertile and the fruit is hanging low. The harvest is great but the workers are few; the blessing and curse of low hanging fruit is that anyone can pick it. The kingdom of God needs more workers to gather in the harvest lest these souls be taken by the enemy. We know the need, Lord, please fill that need. Show us how we can help fill that need. So many needs and so many ways to help. The pat answer is always "prayer and financial support". I do not mean to trivialize these things. Yes. Please give of your money and prayers toward the work of ZOE. They can certainly use them. But I'm also sure God has more in store for you. He wants more for you! God has met each person on this team in a personal, intimate way, and we want that for each person at Evergreen SGV. Prayerfully seek the areas where God is gently tugging at your heart. Step out and go on a trip. See what Christian faith looks like outside of our Western box, see how our brothers and sisters around the world live out their faith and worship. See what God is doing and how He is moving. He desires an inheritance of nation's, and offers us a part in presenting Him that. He also has something for each of us where we are now. What evils do you face? Where is the point of need in your life? God wants to use you and draw you close in that need. The same God who is pulling Thailand out of darkness is pulling on your soul, wanting to give you deeper wholeness. Remember the bleeding woman from the gospels. To her, it didn't matter what others thought. She pursued Jesus with all her strength and she was healed. What do we need healing from? I need healing from my pride, laziness, and selfishness. I don't witness to others as boldly as I should. Thankfully, God still loves me and has used this trip to reaffirm His passionate pursuit of my heart. He can still use my broken heart for His glory if I let Him. The harvest is great and the workers are few. Praise God, He uses imperfect workers to participate in the harvest. We are praying that you allow God to meet you at your point of need, and that He provides for that need with rescue and redemption in a way only our good Father can. You are His beloved child! PS, if you are interested in partnering with ZOE, please visit their website. If you want to learn more about our trip, we will be presenting on Sunday, October 7 at 9:30AM at Evergreen SGV. So for Sunday worship we were back in the worship center where we had experienced the ZOE prayer meeting two nights prior. We had just enjoyed the cry-fest that was the ZOE debriefing process, and like a dummy I thought I wouldn't need any more tissue for worship service. I picked a spot on the straw mat, between a few ministry students I had the immense privilege of locking arms with for a few days, the sun was streaming in through the window (the sunniest morning we've had this week), and Pidetch, a man I had seen working tirelessly as part of the outreach and prevention leadership, started tuning his acoustic guitar. Ministry school students poured onto the stage: drums, bass, electric guitar, five additional vocalists, Yaw on keys. It looked an awful lot like Sunday mornings at Evergreen: a group of Asian lovers of Christ preparing to usher their brethren into the courts of praise. "I lay my life down at You feet, for You're the only one I need, I look to You and You are always there!" "In troubled times it's You I seek, I put You first that's all I need, I humble ALL I AM all to You"
"You are the Way, the Truth, and the Life, we live by faith and not by sight for You. We're living all for You,"
Not an ounce of cynicism. No irony or hypocrisy. This is what they live. They live the constancy of Jesus. They see that He is always there, and that He will never ever change, no matter how troubled the times. When they sing "Lord I give You my life", as they did next, heaven smiles and affirms their worship. Their mission feeds their worship, which feeds their mission. That is the definition of integrity. "The thief comes only to steal and kill and destroy; I came that they may have life, and have it abundantly." This child of God who had lost everything she had on earth knows life abundantly because she is surrounded by the love of Christ. In her small but wise voice, she boldly declared "I know I have it, and I hope you have it, too". By this time, I didn't care that I didn't have any tissues because wiping my tears away wasn't going to do any good anyway. How humbling to know that a 9 year old child knows more about God's provision than I do. She was one of the little ones singing at the top of her lungs, worship that was an outlet for the abundant life she knows in Christ. God has placed eternity on our hearts so that we might desire something beyond the world we can see, that we might desire God Himself. ZOE is a place where this pan-dimensional tapestry that God is weaving into His love story folds in on itself and we can see a glimpse of the glory He is bringing about. Here is a glimpse of the kingdom of heaven, where the broken are pursued and brought back into relationship, tears are wiped away, and the least of these are put in the place of highest honor. And this is all done because of His provision. Yes, He has and continues to provide for ZOE's financial needs, but moreover, He continues to open doors to ministry, raise up spiritual warriors, and bring hope to bear in these kids' lives. None of these things happen apart from the Lord; the ZOE family lives out that desperate dependence. Brothers and sisters, let me humbly encourage us to take a hard examination of the areas in our lives where we have become comfortable. As the history of mankind shows us again and again, comfort leads to complacency and then to selfishness. Selfishness keeps us desiring comfort and we become paralyzed in fear of losing what we think we deserve. Stealing a saying from Pastor Rocky, the enemy doesn't care how you're deceived just so long as you're deceived. How is the enemy deceiving you in order to keep you from doing something (no matter how big or small) for God? In Southern California, it's easy to become comfortable and ultimately forget who the Giver of all comfort is. Let's ask Him to replace our complacency and selfishness with an ever-growing desire for Him, whatever that may look like. Because when we make the Lord our desire, He fulfills that desire with life abundantly. PS on the plane for our return trip tomorrow! I'll try to reflect and send a closing message in a few days. Please pray for our return trip. We are all spiritually filled but physically drained! Please pray that our re-entry goes smoothly and that the lessons we have learned this week stick in our hearts and make a lasting difference in our lives! Wow, these kids. Each one at one point abandoned by society, cast aside, and stripped of worth. Each one pursued, rescued, and then ushered within these walls to be surrounded by the love of Christ. Each one on their own path to restoration. In the interest of preserving these precious ones' anonymity and privacy, I will refrain from sharing any details, but know that whatever you might imagine was taken from them isn't even close to what was lost. But thank God that He is a God of redemption. He can take the darkest tragedy and turn it into the most miraculous love story. These are the kids who through the love of Christ are in a place where they lay their hands on complete strangers in prayer. These are the kids who of their own accord put together a fundraiser to support the children of a nearby orphanage. Whatever the enemy tried to take away from them, God has redeemed. I do not mean in any way to minimize or trivialize the great loss and sadness each has been through, but by some miracle, God is bringing about beauty in their lives, and they are able to give from that overflow. So it was these amazing kids whom your team was called to assist medically on this trip. These precious little ones who hold such a deep and sacred place in God's heart. Over 50 kids, four hours, one pediatric nurse practitioner, and one cardiac anesthesiologist, with the help of your Evergreen ZOE team, the ZOE staff, and an army of prayer warriors. An hour went by, and we had seen...8 kids. With two practitioners, that comes out to 15 minutes per kid, pretty amazing by office standards (ask a medical friend). But with three hours, and still over 45 kids to see, that math just didn't pencil out (about 7 minutes per). I would be lying through my teeth to say I was champing at the bit to see what God was going to do through this impossible task. To be totally honest, I was downright moping. "God, why did you send me here to fail? Why did you make me fall in love with this place, and then display my inadequacy for all to see?" There's a reason half of our team serves on prayer ministry. God crafted this team in a certain way for a certain reason. Our prayer warriors got to work. Denna and I reconvened, prayed, and put our hands to the plough. I got to ask each child about their appetite, sleep, school, and hobbies. I got to listen to each priceless little heart. I got to laugh as they laughed at their knee reflexes ("Oooh, magic!"). And I got to let each one know what a joy it was the meet them face to face. At the end of the final three hours, we had only 4 kiddos left to see (we will see them tomorrow)! Yes, we addressed some medical anomalies, but this was about Jesus doing His thing with two fishes and 5 loaves. And with the leftover baskets, Fred and I were able to assess and pray over one of the children's home moms (I had a little leftover time because there were fewer boys to be seen)! Sometimes, when we sit at the foot of an enormous wall, we think to ourselves, "There's no way I can scale that." Then God says, "you're right, you can't." And with a twinkle in His eye He says, "but watch!" Then the trumpets blast, and the wall comes tumbling down. Sometimes, we sit in the darkness thinking God has left us. And suddenly we realize that we are the chick gathered under the mother hen's wing, held close to her heart. What I had forgotten was that these are God's kids. The kids He found in the darkness and chose for His own. And He will provide for them according to His might, not mine. My encouragement to you is this: you are God's child. He found you in the darkness and chose you for His own. And He will provide for you according to His might, not your own. So whatever wall you're facing, stand there with confidence and see how He will provide a way. Let Him gather you under His wing. Jason (on behalf of your Evergreen ZOE team). PS, one more full day at ZOE! Tomorrow we attend worship service with the ZOE family, finish out our medical exams, and teach the kids about dental hygiene. Please be praying for divine appointments and as many opportunities as possible to support the amazing people doing God's work here long term! It would be a gross understatement to say that we all face obstacles--what Isaiah refers to as waters, rivers, fires--in the form of various trials, struggles, and discouragements. Such is the plight of a fallen world placed under the dominion of fallen people. Practicing medicine in the US, we may think that children's health challenges consist predominantly of ensuring a healthy lifestyle (avoid overly processed foods, get outside for 60 minutes a day, limit time in front of a computer or smart phone screen). Parenting in SoCal, we may think the major challenges of parenting involve ensuring our kids develop gratitude, avoid a sense of entitlement, and not become bullies. Worshiping as part of the western church, we may think the Christian walk--the "cross" we are called to bear--is comprised of showing up in time for offertory, singing loudly enough that your neighbors know you're worshiping, but not too loudly as to be deemed "charismatic", and saying we'll pray for our missionaries. This is not to trivialize such challenges. These are real and pressing issues that we must confront with integrity and good stewardship before God. In addition, though, may we never forget that just as we see throughout the story of the Bible (and in our own lives for that matter), the troubles we face tend to narrow the scope of our vision as to what God is doing with His creation on a grander scale. We forget that children around the world go to bed hungry and get sick every time they drink from their contaminated water supply. Families are stuck in a cycle of poverty that tells loving but trapped parents that it is a proper decision to sell one or more of their children into slavery. And in the midst of it all, God's church is called to do His kingdom work of bringing His redemption and restoration into the broken creation that He loves--to make His victory a reality by the power of Christ. God promises to walk through the waters and fire with His children. The same God who cares enough to walk with us through the struggles we face at home, at work, and in community has a heart that also breaks for the evils taking part on the other side of this great globe. Sometimes, His presence takes the form of His followers carrying His light into the darkness. The team you are sending to Thailand this September will be supporting the ongoing labors of ZOE international. Aside from witnessing firsthand what God has been doing through the amazing people at ZOE, we will be providing health assessments to orphans rescued from human trafficking and to the ministry students who are taking up the cause of breaking the cycle of evil. We will also be assisting in outreach to nearby villages to educate refugees and natives as to the perils of human slavery. We are humbled and thankful that God has placed the saints at ZOE in a position to shine His light deep in the heart of this evil. In the face of such darkness, please partner with us by praying that God would walk with us, allowing us to show and see His presence. As we take up arms alongside other Christian soldiers in the spiritual battle, may God show His victory over the tyranny of sin! We will blog the ways we witness God at work during this journey; hopefully as you read, God will reveal the ways in which He is bringing about victory in your trials as well! If you are interested in learning more about the work happening in Thailand through ZOE international, visit their website. Imagine you live in a place where most of your community consists of people who have been torn from their original homes due to civil war in their own country. Say the wealth of the people where you live is literally nonexistent and most live by subsistence farming. Each day is filled by working the land as long as the sun is providing enough light to see. Of course, you want more for your child so you send them to school, and since you don’t have a car or motorbike, they live there during the week instead of working on the farm. But because you love your children, you accept the extra work happily. School is the pathway to opportunity for them. Now imagine your child returns home for the weekend and tells you the school took a day off from formal education to play games and watch a drama program by a bunch of college kids from the “big city” and some strange looking people who traveled all the way around the world to help. How would you feel? Now, imagine there hadn’t been a program and you send your child because working at a hotel sounds like such a great opportunity. Your Zoe team spent the past two days in the Mae Hong Song region of Thailand. 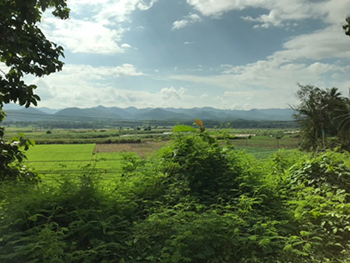 It is along the border between Cambodia and Thailand and is deep in the “Golden Triangle”—the center of the Burmese and Cambodian refugee crises. People in this area exist in extreme poverty and are prime targets for traffickers. They prowl throughout the area as wolves in sheep’s clothing, promising hope, opportunity, and money to people who are devoid of all of these things. They may offer a “job” at their hotel or restaurant, and if successful in their deceit, then extort the child for forced labor, organ harvesting, prostitution, and other unimaginable evils. I’d like to introduce you to a man named Wit (picture attached). The ZOE prevention team is his brainchild. His life mission is beautiful in its stated simplicity: to end human trafficking. The logistics are another story entirely. As the lead for ZOE prevention outreach, and soon to be promoted to head of ZOE child rescue, he is in a position to give skeptics a serious run for their money. His is a tireless job, constantly developing relationships with schools and communities prior to planning outreach events (give and take in Thailand all revolves around relationships), executing outreach, and following up in order to maintain these relationships, along with his work with the Child Rescue arm of ZOE. His faith in Christ demands such tireless devotion. Under Wit’s direction, the ZOE prevention team and ministry school students perform outreach events at least twice a month, traveling through the region to spread knowledge about the ways traffickers take advantage of people’s trust and sharing the news that they have a Creator who loves them and cares for them. This is a program for Thai people, organized and executed by Thai people, and presented in a way that is accessible to Thai people. This is Thai people giving hope to their brethren who fall outside the caste system (and are hence forgotten by society), and showing God’s unconditional love. And you get to support this work through the team you’ve sent. I’d also like to introduce you to a young man named Yaw. He is 19, and a student at ZMS (Zoe ministry school). He is from an ethnic minority in Thailand called the Karen people (like many of the ZMS students) and aims to return to his village to teach and care for children once he graduates. Even though many of his classmates seek to be pastors, businessmen, or work in government, his heart is for kids and the community he came from. After all, the people he loves need Jesus! Like all the ZMS students, he lives on site, wakes up every morning at 4AM for devotional time, and studies hard at his classes when he isn’t away on outreach trips (during which he piles into an open air van with the other 35 students and sleeps on the floor at night). He also constantly welcomes short term missionaries to his school with a smile that transcends language and a love for God that he wears on his sleeve. His faith in Christ demands such tireless devotion. Wit suffers from back pain and sciatica. A Thai doctor told him he needs surgery, but Wit doesn’t have time to be laid out by surgery and can’t risk a bad outcome. He was resigned to live his life in pain. Yaw had lung surgery and a tracheostomy as a child and now has a narrow windpipe that makes it hard to breathe when he is tired (not that he ever has reason to be tired). Since he is from a village in the jungle, no one ever told him he has options to make his breathing easier. These guys are doing Kingdom work. These men are giants in the faith who can use our church's prayers as they take up arms in the battle against evil. And I’m put upon because today forgot my face wash in the last hotel, and then got bitten by a red ant. In a very small way, though, I get to be a part of these men’s work. As part of the Evergreen medical team, I was able to give Wit a program for stretching, counsel him on back hygiene, and present the option of physical therapy (his Thai doctor did not offer him any of these things). I was able to tell Yaw that there are things that can be done to relieve the tightening of his windpipe. I also let him know that he still has most of his right lung (he had been told it was totally removed). Now, every time they see me, they thank me and refer to me in Thai as “sir doctor”. These are mighty Christian warriors who live out the gospel with their every breath. Somehow I deserve their gratitude because...? 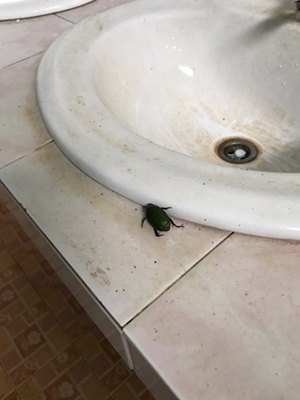 Oh yeah, I traveled to a different country where I found a dead beetle next to the bathroom sink. And the urinals at the gas stations are outdoors. You have sent your ZOE team to Thailand to walk among giants. They are doing God’s work, and in some small way we are able to bind their wounds to help edify them to continue on in the battlefield. Oh, and during today’s outreach event, 103 students expressed new faith in Christ. PS we’ve spent most of our time with ZOE’s rescue arm (the most dangerous part of fighting trafficking) and prevention (the most effective). Tomorrow we start with restoration (the hardest part), as we will be visiting the children’s home for the first time. Please be praying for the children and house parents. Also, today was the official halfway point of our trip. Please be praying for continued health and unity, and that we would be able to finish strong! Boarding our second flight (3.5 hours from Taipei to Chang mai) following the 14 hour haul from Los Angeles to Taipei, I took a moment to change my compression socks to toe socks. I know some people (my wife) cannot bear the thought of cloth between their toes, but for me it’s strangely soothing, especially when my feet feel hot and gross. Wow. God has provided and will provide what we need in order to bring Him glory and further His kingdom. This is truth in general, to be sure, but in a specific sense: I am doing nothing to make this plane fly. I am doing nothing to assure my safe arrival in Thailand. God has provided these things so that I can preoccupy myself with the sweat between my toes. In the same way, I do nothing to earn my salvation and it will not be my specific efforts that may or may not bring the Gospel to the villages we visit during outreach. Fred encouraged and reminded our team that sharing the gospel in Thailand is completely different from sharing it in the states. Our concepts and contexts of spiritual need and salvation are worlds apart. However, being helpless is not the same as being hopeless. Paraphrasing from the book “Wrestling with an Angel” (thank you, pastor Dan! ), God places burdens on us we cannot possibly bear alone so that His power may be made perfect in our weakness. To be saved, we all must be raised from spiritual death, given a new heart that loves and desires Him, given a new mind that treasures the Gospel, and given saving faith in Christ’s sacrificial death for our sins. All these actions are passive. It is a work that we all receive by the great grace and mercy of God while our hearts were/are still dead in sin. Sawasdee Krup (a polite and friendly "Hello!" in Thai)! We are here at LAX (Saturday, Sept 1, 2018, 10 pm), safely through security and waiting at our gate! Funnily enough, Irene was pulled aside for "random screening", and my bag was searched not because of the lithium ion batteries, or the church's GoPro, or the liquids I forgot to pull out of my bag, but because of my lacrosse ball! We are so blessed by the huge turnout for our departure (upon first approximation, about 50 strong!). Personally, I was given a set of cards for each day of the trip from both my prayer partner support group and my daughters! This evening was a great reminder that we are not traveling just the eight of us, but we have our families and our church family sending us and partnering with us on this journey. Seeing the team members breaking off with their respective support teams, brought together for a purpose, I was struck by the fact that this is indeed a work pre-planned and fore-known by our great God, who brought this team together for whatever work He has before us. So we have this assurance that no matter what comes, nothing is by chance or by accident. As Irene mentioned during our prayer time tonight, please pray for team unity, as well as flexibility as we embark on this journey! 14 hours to Taipei, two hours on layover, four hours to Chiang Mai. Then the real work begins!